Wealth and love go hand in hand this February at Sloto’Cash! Want to know why? 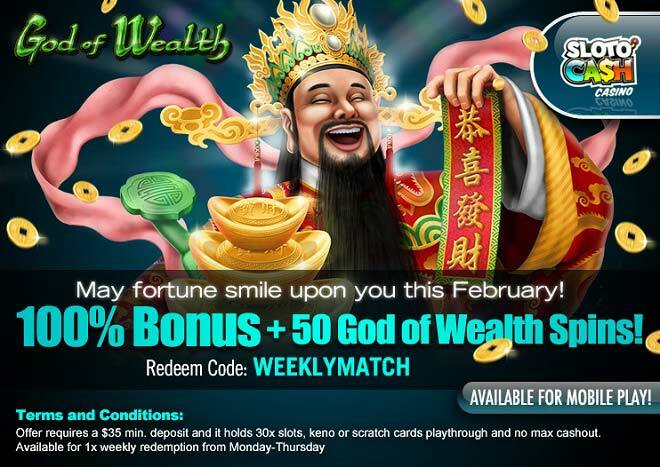 Find out for yourself when you deposit a minimum of $35 that’ll open the door to a 100% Match + 50 God of Wealth Spins! Try your luck at a 25 payline and 5 reel slot machine that’s packed with good fortune and huge wins! God Of Wealth takes you on a winning journey where luck will become your number one love this month! Land 3 or more scattered Gold Ingots anywhere on the reels to trigger Free Spins! More wins head your way when the God of Wealth symbol appears on reel 3 during the free spins round! Prosperity, success, love and tons of winning chances are happening for you once a week from Monday thru Thursday!